The Bradford Rattlers have re-signed #27 Adam Briski and #25 Matt Barrette for the upcoming 2016-2017 season. Briski is a 1998 born forward hailing from Slovenia standing 5'11" and weighing 180lbs. Last season with the Rattlers, Adam notched 5 points through 27 games in his rookie season. The 17 year old forward improved dramatically through last season and is expected by management to play a bigger role on this year's team. 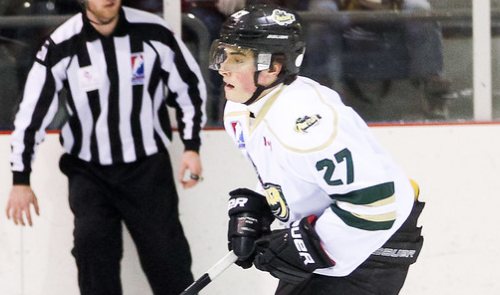 The club also confirmed that 18 year old Canadian forward Matt Barrette has been resigned by the Rattlers. The 18 year old Barrette stayed after the season in Bradford and has been training every day with the AAA prospect team. In 28 games last season Barrette had 9 points (4g, 5a) and was considered one of the most improved players from last year's roster. The Rattlers are expecting Barrette to continue to develop through the off-season. Stay tuned to www.rattlershockey.ca for more player signings.